The Slimstone is an innovative product, a revolution in the use of marble or granite. It is very thin - five millimeters - and allows for a huge range of application possibilities. From homes to corporate spaces to elevators, airplanes or yachts. 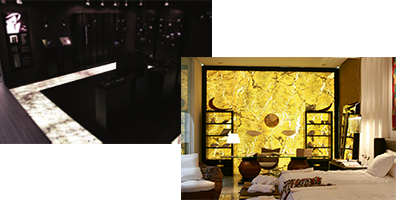 It can be used on walls, floors, ceilings or furniture, the Slimstone can be applied indoors or outdoors. It is an ecological, lightweight, sturdy, versatile, technological and translucent product. In its Lumen version, the Slimstone still allows light to pass through, creating stage effects through the use of backlight. It has become an increasingly strong trend when it comes to sophistication without the limitations of conventional stone. S.C.A Ópera Slimstone Collezione Grupo SCAIntegrated solutions to live, work and build.